Driving during the winter months can be downright scary. Without a set of capable tires, driving will be very dangerous. Can your vehicle handle snow, slush, and ice? The best way to prepare for the unpredictability of winter roads is by installing winter tires a.k.a. snow tires on your vehicle. Winter tires are designed specifically to provide reliable traction and performance in such conditions. Below, we have two affordable winter tires that you can consider if you don’t want to spend too much money to face the winter: AltiMAX Arctic vs iPike. AltiMAX Arctic is produced by General. The company is not exactly a well-known brand if you compare it to names like Goodyear or Bridgestone, unless you ask the question to a tire geek. However, General actually features a long history in designing and producing decent yet inexpensive tires. AltiMAX Arctic is one very good example of the company’s character. It is without the bells and whistles, but it gets the job done. It doesn’t appear fancy, but it is a workhorse. AltiMAX Arctic is a standard winter touring tire. You can purchase it either with the optional studs installed or unstudded. As a matter of fact, this is one of the last winter tires that are designed for both studded and unstudded uses. Nowadays, most manufacturers usually separate the designs for studded and unstudded tires. In general, AltiMAX Arctic is good but not great. However, for the money, it is already a very good tire. You can’t find a much better alternative in this price range. Even without the studs, it is quite reliable for driving through light snow. The wide and deep sipes help the tire to maintain its traction. The sipes are also quite efficient at evacuating snow and debris. It is definitely better than most all-season tires. However, for the best performance, you may need to install the studs. By installing the studs, you can increase the tire’s grip and traction so that you can drive through some of the deeper snow and icy roads. That said; try to avoid accelerating too quickly because the tire seems to take some time to get enough traction. The performance on dry roads is just good. The handling is quite solid and responsive. However, it can be pretty noisy. Also, avoid using the studs on a dry road because they can actually damage the road. 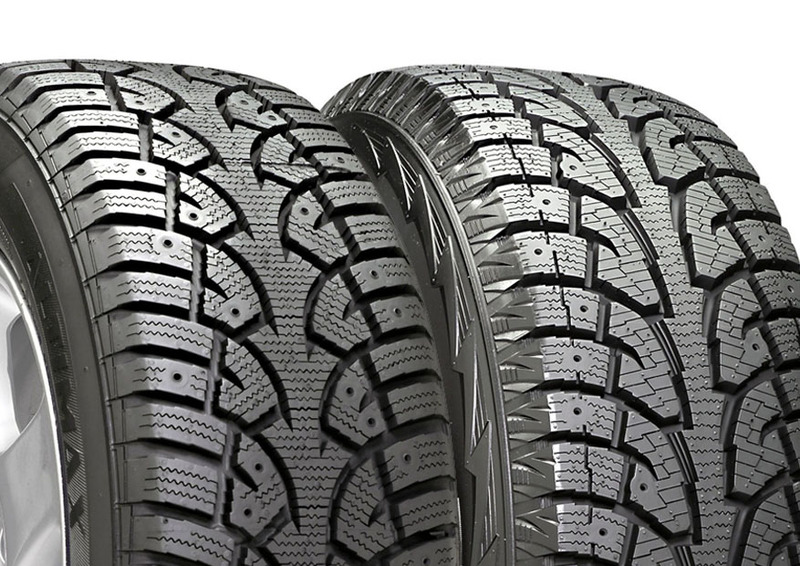 Hankook iPike is a winter tire that is specifically made to be used with studs. But, well, you can indeed remove the studs. Keep in mind that studded winter tires may be illegal in some states because they may damage the roads. At first, AltiMAX Arctic vs iPike may seem like very similar tires. They even have very similar sipes. However, if you observe the tire more closely, you may notice that this tire has more fine sipes. The more numerous fine sipes can create more biting edges to handle wet roads. There are also textures on the shoulder lugs to promote the traction. However, the major sipes seem to be narrower than and not as deep as AltiMAX Arctic’s sipes. The tire is highly durable. The enhanced tread compound ensures high steering response and long treads life. It is designed with the Stiffness Control Contour Theory Technology to increase the stiffness and integrity of the sidewall. It has a wide contact area to increase ice traction and reduce wear. So, how do AltiMAX Arctic vs iPike compare in terms of performance? First of all, if you don’t want to use the studs, Hankook iPike is not recommended. Without the studs, the performance is greatly reduced to the point of being dangerous. To be fair, it is still better than many all-season tires, but it is still not a good winter tire if without the studs. Apparently, this is because of the narrower sipes and the stiffer tread elements. The snow traction is excellent as long as it has enough snow to get a grip in. It can even maintain fairly aggressive speeds in slush. However, the performance on packed snow and ice is disappointing. If you need to drive on such surfaces, you have to install the studs. Finally, note that AltiMAX Arctic vs iPike winter tires are available in different sizes. If your vehicle’s wheel diameter is relatively small, you may get a better chance with AltiMAX Arctic. This model comes with smaller sizes that are suitable for wheel diameters from 13” to 17”. However, if your vehicle’s wheel diameter is relatively large, Hankook iPike can give you the tire size that you need. It is available in larger sizes for wheel diameters from 15” to 20”. For the money, AltiMAX Arctic is a very good value. It is not the beast that will bring your car to blazing speeds in the winter months, but it is great for average drivers who need safe and reliable traction. Unstudded, it is still usable in light snow. Studded, it offers great performance in deep snow and on icy roads. On the other hand, Hankook iPike can be your choice if you need a set of tires for larger wheels. However, this tire requires the studs to perform on packed snow and ice. Without the studs, the performance is not very good.